Daddy Yankee returns with yet another banger entitled "Sigueme y Te Sigo" which translates to "Follow me and I'll follow you back". It is a nod to the instagram generation. The Puerto Rican king of reggaeton encourages the youth to socialize by following each other on social networks like instagram or twitter. 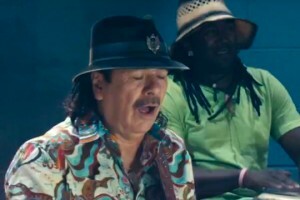 The catchy tune was written by the 38-year-old singer himself (real name Ramón Luis Ayala Rodríguez). The dancefloor-ready track was produced by Chris Jeday and Gaby Music. "Sigueme y Te Sigo" is taken from Daddy Yankee's upcoming eighth studio album 'King Daddy 2', set for a 2015 release via El Cartel Records and Nazza Records. As a coach on the TV show "La Voz Kids" (The Voice Kids) Daddy Yankee hopes to connect with the new generation of reggaeton fans through his new single. The music video was directed by Jessy Terrero and follows an unlikely couple of teenagers who run into each other at a school dance party but have trouble connecting with each other due to their lack of popularity on social media. Watch the clip to find out if Daddy Yankee's presence and live performance will help transform the students into new social media icons and who will be crowned the king and and the queen of the evening. While you watch the visual for "Sigueme y Te Sigo" below, you can scroll through the lyrics and follow along for a karaoke-like experience. Once you've got your fix of Daddy Yankee's music, you can show your love in the comments section. Be sure to spread your euphoria on a social network of your choice. Be supportive of your favorite artists. Buy their music and take it with you everywhere you go. The music video premiere of Daddy Yankee's single Sigueme y Te Sigo has already been viewed 25,605 times since it was posted on Sunday, June 7, 2015. The video belongs to the music genre of Latin.